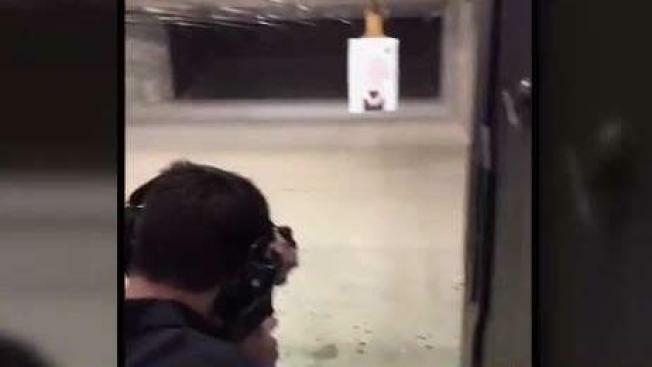 NBC 6's Johnny Archer reports on the Parkland student who said he was questioned by officials for going to a gun range. A Marjory Stoneman Douglas student alleges he was aggressively questioned by school administrators and local law enforcement after posting on social media that he fired an assault weapon at a gun range with his dad. Junior Kyle Kashuv said he was brought in for questioning Monday by a school security officer and a Broward County deputy in what he says was an attempt to intimidate him. "I can now check off being wrongfully questioned by law enforcement off my bucket list," tweeted Kashuv, adding "school will be interesting for the remainder of my tenure at MSD. I am not looking forward to it." On Tuesday, Kashuv told Fox News host Tucker Carlson that the meeting with officials was an interrogation. "It was a clear attempt to intimidate me, and they used very, very, very harsh intimidation tactics," Kashuv said. After first being questioned by a school security officer, a Broward County deputy entered the room and sat behind the teen, Kashuv said. The deputy began asking Kashuv who the rifle belonged to and who he went shooting with. Kashuv said he asked if he could record the interview and was told that he couldn't. The teen said he felt like the deputy was trying to get him to incriminate his father. "Students and parents expressed safety concerns to the school administration regarding the social media posts. District staff and school administrators looked into this matter and following a review, determined the tweet messages to be non-threatening," Broward County Public Schools said in a statement Wednesday. "In addition, school administrators did talk with the student. We defer any questions regarding the Broward Sheriff's Office to law enforcement." Kashuv said the gun debate has become so prominent since the Valentine's Day massacre that killed 17 that he "felt it was important to learn about the physical mechanics of it," Kashuv said in a text to The Associated Press. "I made sure to post about it because I wanted to show people it's people that are the issue, not guns." Kashuv also tweeted "Apparently using my constitutional rights to learn how to defend myself is wrong? Sorry, I thought this was still the United States of America." On Friday, Kashuv posted videos on Twitter showing him firing an AR-15 rifle at a target, saying it "strengthened my love for 2A" and taught him "America is the greatest country ever, where freedom intensifies and liberty is required to be a real American." His posts came as thousands of students around the country walked out of school for gun reform in honor of the 19th anniversary of the Columbine shooting. Kashuv has been a vocal supporter of gun rights and garnered heavy support from conservative pro-gun groups. The teen has drawn criticism from the core #NeverAgain students, including Emma Gonzalez and David Hogg, who have repeatedly called for a ban on assault rifles. A Broward Sheriff's Office incident report confirmed the meeting, but didn't provide any specific response to Kashuv's claim that the deputy used interrogation techniques against him. A school security supervisor told the deputy several students had expressed concern about the social media post, even though no threats were on the video, the report said. When asked about the post, Kashuv said he had borrowed the rifle from a friend and went shooting with his father, the report said. Officials contacted Kashuv's mother, who stated she knew about the video and the trip to the gun range.